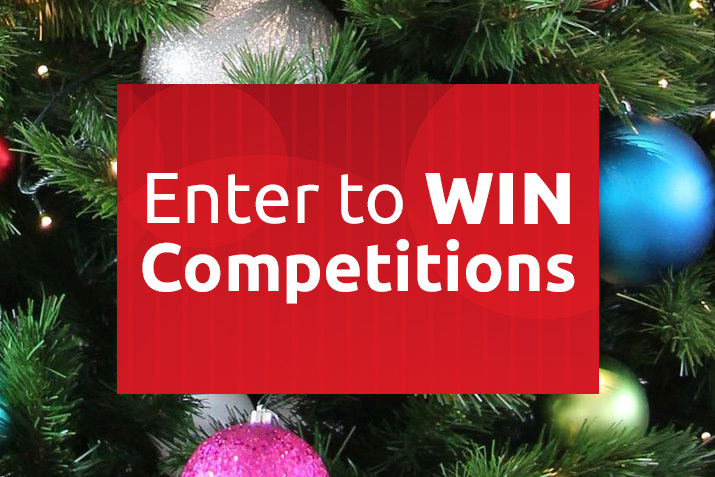 Dress up for the Christmas season with holiday costume wear and stockings. 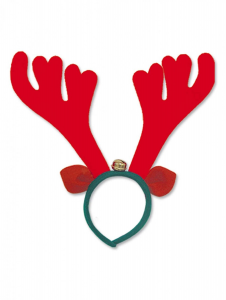 Peruse our festive selection of Santa hats, full suits, and Christmas stockings to brighten your yuletide season. Whether you’re dressing up as the neighborhood Santa Claus or adding a festive touch to your holiday outfit, Santa accessories are a great way to spread the Christmas cheer. Delight youngsters and make relatives laugh with full Santa suits, a white beard, and black boots. 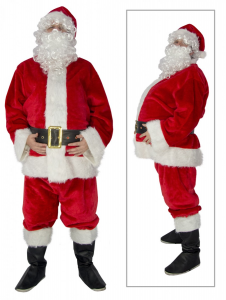 For added effect, carry a sack of presents and stuff a pillow under your jacket to add a jolly Santa Claus belly. 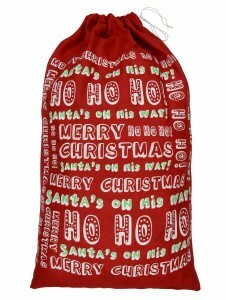 Building your complete costume is easy with household items, such as the pillow or belt, and a festive Santa sack (see our selection of Santa sacks, wigs, beards, and other accessories for more). Relish in the spirit of Christmas with a belly laugh, holiday references, and a loud “Ho Ho Ho!” to make the spirit of Santa come to life. Your performance will encourage young believers that Santa is real and remind adults that Christmas is all about creating joy and giving back. If you’re not ready to commit to stepping into the boots of the great Mr. Claus, start simple. Don the traditional red and white fur cap for your evening of caroling, Christmas cooking baking, holiday parties, or gift - wrapping marathon. The Santa hat keeps you warm while exuding seasonal cheer to help build excitement for the annual visit from Santa Claus himself. As a perfect addition to your Christmas morning routine, the Santa hat elevates holiday spirit and delights your friends and family. 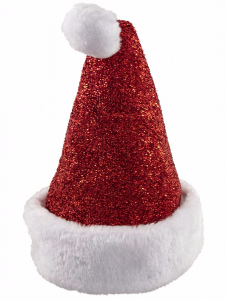 Try a glittery Santa hat for added glitz, or a hat that features text, holly, or other festive motifs. Opt for one of these non - traditional Santa hats to add a trendy, updated twist to the classic fuzzy favorite or keep it simple with yuletide red and white. 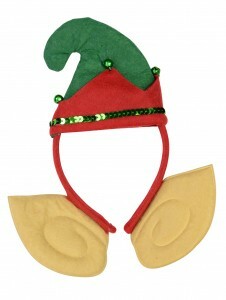 For a fun and playful headwear alternative, try a festive pop - up headband or set of fuzzy antlers. From realistic to glitzy, our selection of holiday headgear is well suited to any holiday party or festive occasion and helps you create a custom look for all your Christmas get - togethers. Your fun and creative holiday accessories will be the ultimate conversation starter and add a dose of playfulness to the traditional holiday routine. When it comes to tradition, holiday stockings are a source of design pride and seasonal comfort. As a large part of the Christmas event, stockings are hung by the fireplace for weeks—sometimes months—in advance. These empty stockings remind us of the coming gift - giving season and help spread the warmth of Christmas cheer. By Christmas Eve, all the stockings are filled with small gifts and treats to be enjoyed later that evening or on Christmas morning. No matter what your holiday practice, the process of opening stockings is a great way to warm up for the big gift - giving extravaganza. As legend goes, old Saint Nick tossed three bags of gold through a poor family’s window and that gold landed in their stockings, where they found it the next morning. This age - old story lives on through our practice of sharing gifts in stockings and delighting in the small, precious things that life has to offer. Choosing your holiday stocking style may be a yearly process, or perhaps you’re looking to create a new family tradition to be repeated in future years. Either way, your stocking options are aplenty. Choose between traditional, conservative styles or lettering, classic holiday detailing or modern designs with plenty of sparkle. Establish a theme among matching stockings or handpick a curated collection of stocking styles for each member of your family. 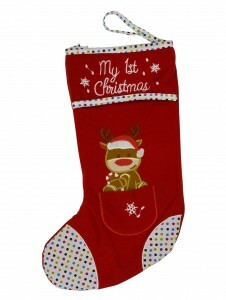 Personalizing your stockings helps you customize a beloved tradition to meet your family’s tastes, style, and interests. The right stocking delights at first glance while it provides ample space for the perfect selection of stocking stuffers. From practical gifts to fun pocket - sized toys, the gift of the holiday stocking is a wonderful way to enjoy the season of giving with your loved ones.